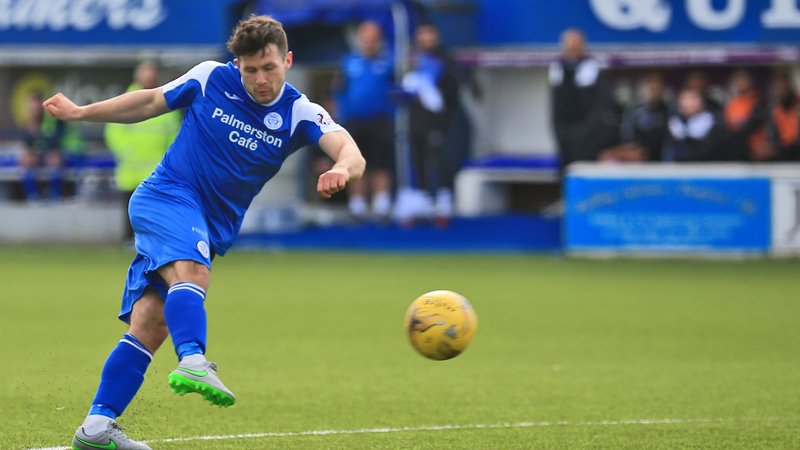 Raith Rovers secured their place in this years play-offs with a win at Palmerston but they were pushed all the way by a Queens performance that would have earned the home side at least a point had it not been for visiting keeper Cuthbert. 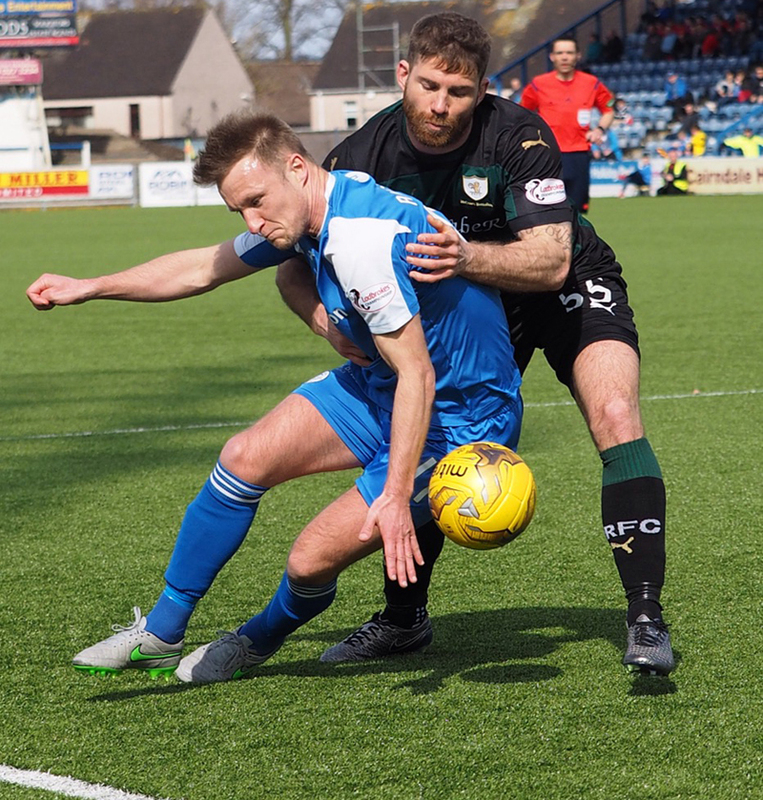 Queens made two changes to the side that drew with Falkirk last week, with Kidd and Russell starting ahead of Lyle and Harris, who both dropped to the bench. The changes also prompted a change of formation from the 4-4-2 favoured recently to a 4-3-3. Kidd replaced Murdoch at right back with the on-loan Rangers player moving into a central midfield three along side Hutton and Tapping. Those two in particular combined well and were involved in all the best moves the home side produced. Russell and Oliver flanked Hilson up front. The game started fairly quietly and evenly until the 7th minute. Craigen showed great control on the edge of the box and somehow managed to fire a shot from a bouncing ball on the edge of the box that looked destined for the top corner, until Thomson tipped it round the post. 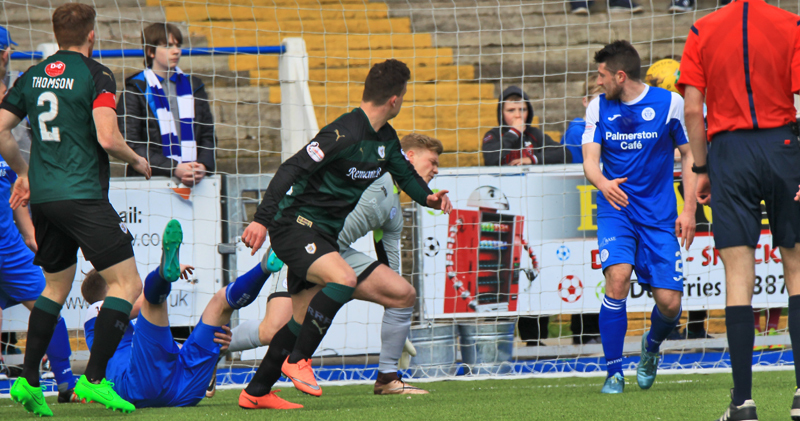 The first corner deflected off a Queens defender at the near post but when the second was swung in Kyle Benedictus found himself unmarked six yards out and powered a header past Thomson to give Raith the lead. Benedictus finds space in the box and heads it past Thomson. It was a lead they looked content to hold for much of the rest of the half. Queens dominated possession but struggled to break down a comfortable looking defence. Raith looked dangerous on the break but neither keeper had any saves of note to make until the 40th minute when Brownlie glanced a header towards goal. There didnt look to be a lot of power on the header but the angle made it difficult for Cuthbert and it was a good save, unfortunately for Queens, the first of many. 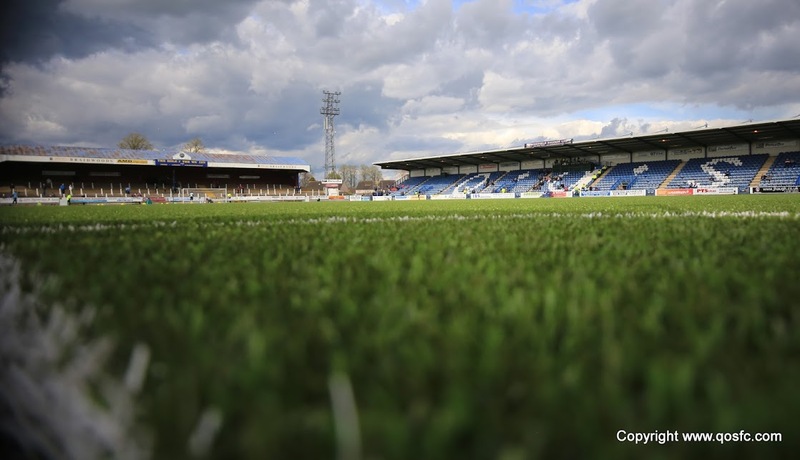 Despite all the possession, some of it very slick at times, Queens were only really creating half chances, typified by the last chance of the half. A cross into the box looked to be going wide but Oliver took a running jump at the ball but couldnt make proper contact and could only glance the ball wide. The second half continued in much the same vain, with Queens enjoying most of the possession. This time, though, they managed to turn that into a goal and what a goal it was! After some nice interchanges in midfield Hutton played a great ball over the top for the run of Hilson. With a defender beside him it looked unlikely a chance would come directly, but Hilson not only won the first header but managed to head it past the defender, turnung him inside out before unleashing an unstoppable shot from the edge of the box. As well as Cuthbert played today he had no chance of stopping that one! Queens continued to press forward but, not for the last time, Cuthbert kept Rovers in it by turning a Tapping shot wide. Raith had their moments, though, and Panayiotou almost scored with his first touch after coming on in the 55th minute but he could only scuff his shot into the arms of Thomson. Back up the other end and Tapping, again, had a chance but could only lift his shot over the bar from the edge of the box. The game had a more open feel to it and was becoming more `end to end` but it was Queens, again, who had the next chance. Kidds delivery from a wide free kick was into a dangerous area and Hutton arrived unmarked but saw his header clawed out by Cuthbert. A great save but a real chance to go ahead that Queens really should have taken. Lyle was ready to celebrate but was cut short when Cuthbert made a quality save. They were made to pay for that miss just 2 minutes later. A corner from the right was headed goalwards until Russell stuck out a boot on the line to keep it out. The ball deflected back to Connolly who delivered into the box again. Once more the ball was only half cleared and fell to Barr on the edge of the box. He hit a shot low and hard into the bottom left corner to give Raith the lead. 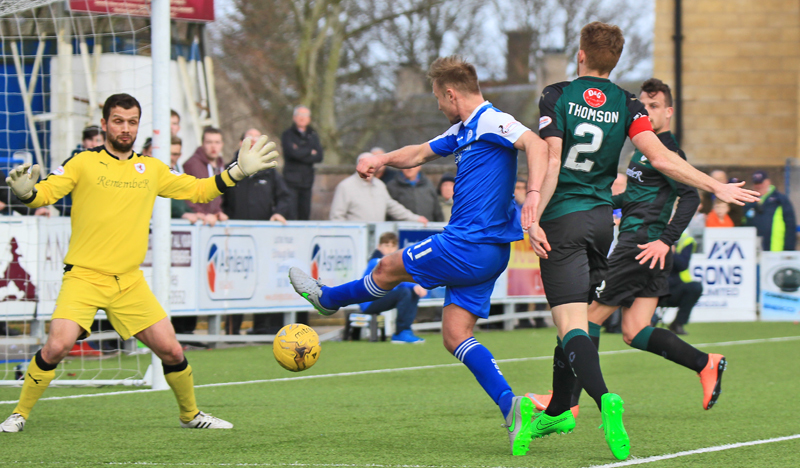 It took just 5 minutes for Queens to create the first chance to equalise. Another corner was sent to the far post. Hilson challenged for the header back which, eventually, fell to Higigns but the skipper guided his shot wide and another good chance went begging. The next 10 minutes were fairly even but uneventful apart from an injury to Hutton which forced the midfielder off. It was a blow to Queens as he had continued his recent good form in the middle of the park, linking up particularly well with Tapping. Into the final 10 minutes and Queens created 3 decent chances to win the game. First Hislons header looked to everyone in the ground as if it was hitting the back of the net but Cuthbert somehow got a hand to it and kept it out. Next, Kidd hit a cross in from the right which ended up heading goalwards. For once Cuthbert was getting nowhere near it but the ball cannoned off the bar and out to safety. It was Cuthbert next up though as he saved with his legs after Russell got in behind and got a shot away from close range. The final action of the game saw a Queens corner cleared back to Millar who delivered a cross to the back post. Lyle lined up a shot (definitely `shot`!) but blazed it over the bar and almost over the terracing roof! So Raith notch up another win in whats been a fantastic run and, deservedly, clinch at least 4th place. As Queens know its a tough ask in the play-offs to go all the way from 4th but no-one will fancy facing Raith in the form they are in. 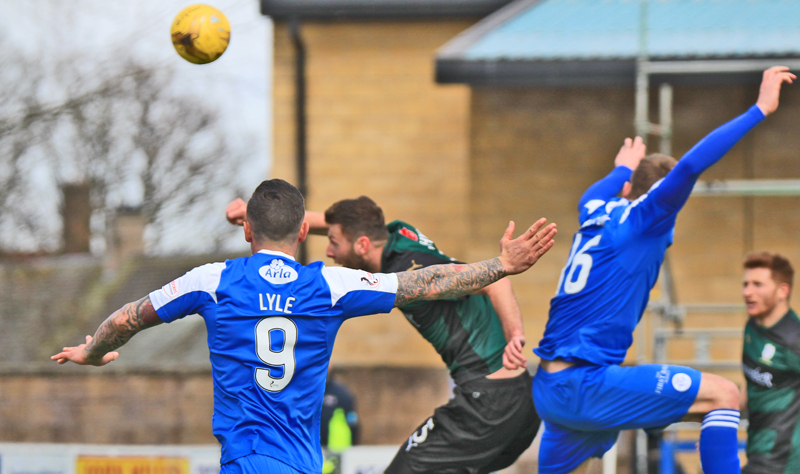 For Queens, it could have been a very different score but for the Raith keeper. 84 min Another great save from cuthbert. Hilson thinks his header is in!